Few people predicted a blowout in Super Bowl XLVIII, and those who did likely did not expect the Broncos to be on the receiving end. Before kickoff on Sunday there were a great many expectations and predictions going into Super Bowl XLVIII. Weather was supposed to play a major factor as the NFL entered the unfamiliar territory of a northern open air stadium in February. Peyton Manning, the wily veteran QB who broke all manner of records during the regular season was supposed to do much more than hold his own as he returned to the Super Bowl. The Seattle Seahawks, who had the top ranked defense this year, were supposed to be underdogs against the most productive offense of all time. Instead, despite today’s snow, it was one of the nicest weekends the New York/New Jersey area has seen all year with temperatures at 49° when the teams took the field at 6:30 PM. Manning, despite a Super Bowl record 34 completions, labored heavily to get anything going on offense and ended up with only one touchdown to his name. The Seahawks, despite being a continent away from their raucous home crowd, brought the “Legion of Boom” with them and dominated the night from start to finish. The very first snap of the game set a tone that would hold through the rest of Super Bowl XLVIII, as Broncos center Manny Ramirez snapped the ball over Peyton Manning’s head and into the end zone, resulting in a safety. Seattle scored the fasted points in Super Bowl history—just 12 seconds into the game—and they hardly even had to lift a finger to get on the board. A short kick gave the Seahawks’ offense the ball at their own 36-yard-line, and Russell Wilson quickly got them into position for a field goal to go ahead 5-0. When Devner got their hands on the ball again a penalty on the kickoff put them at their 35, but Manning and crew went three-and-out, setting Seattle up for another scoring drive and an 8-0 lead. The Broncos didn’t even get to see fourth down on their last drive of the opening quarter, as Peyton threw his first interception of the day on third and seven, picked off by Kam Chancellor. Marshawn Lynch did most of the work plucking away at the short field Seattle was left to cover after the pick, and ran it in the final yard to get the second quarter started with a quick touchdown. Denver was finally able to sustain a drive in the second quarter, though the effort would ultimately backfire. A series of short passes got the Broncos from their own 16 all the way down to the Seattle 32, however, a tripping call cost them ten yards and sent the team back near midfield. 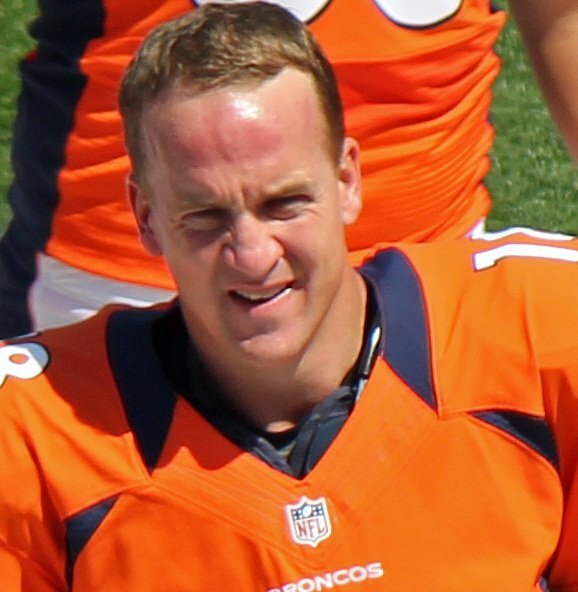 After a loss of 2 on second down, Peyton tried to cover the thirteen yards needed for a first down with a long pass to Knowshown Moreno; instead he threw the second interception of the game, this time picked off by Malcolm Smith who brought it back 69 yards for a touchdown to send the Seahawks ahead 22-0. Halftime did the Bronco no favors, as they found themselves in a deeper hole right out of the gate. A 52-yard kick gave Percy Harvin the ball at the Seattle 13, and he brought it all the way pack for an 87-yard TD to make it 29-0 a mere 12 seconds into the second half. Later in the quarter Demaryius Thomas fumbled a 23-yard pass from Manning deep in Seahawk territory; Malcom Smith recovered and brought it back to the 27. Another penalty on Denver gave Seattle prime field position once again, leading to a quick TD when Wilson connected with Jermaine Kearse for 23 yards after just five plays. Now down 36-0 and backed up to his own 10 thanks to yet another penalty, Peyton Manning was finally able to lead his team on a scoring drive as he took them 90 yards in 7 plays. A successful two-point conversion made it 36-8 at the conclusion of three quarters. Desperate to cover a 28 point spread in only 15 minutes, the Broncos attempted an onside kick to start the fourth quarter. The Seahawks recovered, and Russell Wilson got the ball at the Denver 48. A deep pass to Kearse for 34 yards would put them at the 10-yard-line, and a toss to Doug Baldwin got them back into the end zone once more. Seattle went up 43-8, and would go on to win by that margin. Peyton Manning went 34/49 for 280 yards, a touchdown, and two interceptions. Thomas led Broncos receivers with 118 yards on 13 catches with a TD, followed by Wes Welker with 84 yards on 8 receptions. Moreno ran for only 17 on 5 carries. Russell Wilson threw 18/25 for 206 yards and two TDs. Baldwin caught for 66 yards and a touchdown on 5 receptions, and Kearse caught for 65 and a TD on 4 receptions. Percy Harvin ran for 45 yards in addition to his 87-yard scoring kickoff return, and Marshawn Lynch ran for 39 yards and a TD. After the game, in a rare move for the NFL, the Super Bowl MVP Award was given to a defensive player. Seattle linebacker Malcolm Smith received the honors, having recovered a fumble and picked off Manning over the course of the night. Photo by Jeffrey Beall, via Wikimedia. Subject: LongIsland.com - Your Name sent you Article details of "Seattle Seahawks Decimate Denver Broncos, Defying Super Bowl Expectations"